1950s: Japanese Foreign Minister Mamoru Shigemitsu and General Yoshijir? 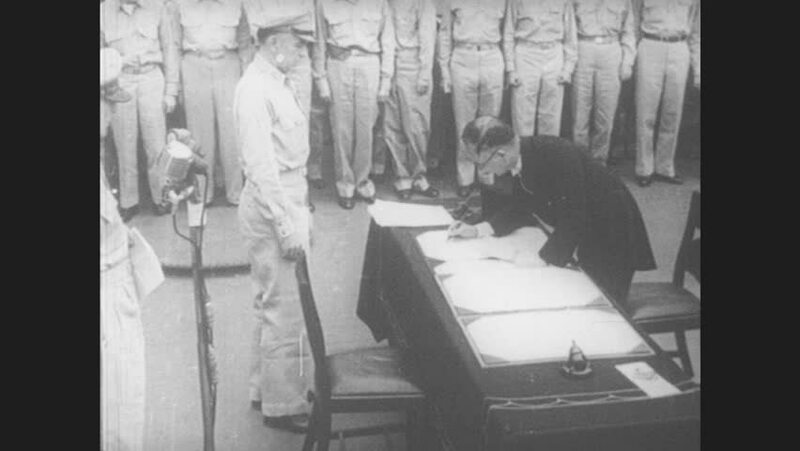 Umezu sign the Instrument of Surrender as Douglas MacArthur, USA navy and photographers stand on deck of USS Missouri. hd00:35CIRCA 1940s - US Marines and Army ground forces storm beach heads in the Pacific. hd00:171940s: Man inspects hanging meat carcasses. Hostess scans busy restaurant dining room. hd00:221920s: Dock with people and boat anchored. People on boat. Horse pulls carriage, people walk on dock. Ship full with people anchored next to dock. hd00:30CIRCA 1943 - Men come to meet the crew of B-17s that have just landed on their air field. hd00:241950s: booking officer at desk passes restraining belt through slot in security window. police officers in uniform wrap leather strap around torso of man in handcuffs. hd01:01CIRCA 1926 - Children shake snow from trees as they walk with adults in a wintery forest at Christmas.